Back in the day, one of the big reasons for going ahead with HS2 was the supposed fact that it was going to be a green solution and that it would contribute to a reduction in the UKs carbon footprint, in line with the Kyoto Protocol and the 2008 Climate Change Act. Since then the modal shift figures have dropped and dropped, until HS2 Ltd gave up reassessing them in October 2013 when they hit rock bottom, as they realised only 1% of HS2 passengers would be expected to transfer from flights. But back in 2010, the issue of taking flights out of the air was a big driver for HS2, with the All-Party Parliamentary Group for High Speed Rail being founded originally by MPs opposed to a third runway at Heathrow. The idea was that high speed rail might be an alternative to a third runway, as it could link up airports and the Channel Tunnel. This was supposedly going to mean there would be a reduction in internal flights. Not only was that concept spurious due to the low number of flights between the possible destinations of HS2, but any removal of internal flights would surely have seen those slots replaced with services flying to more far flung destinations, increasing carbon emissions. However HS2 was designed without connections to either Heathrow or HS1. While these links were retrofitted for a while, the only airport now planned to certainly have a station near is Birmingham, with Manchester airport seemingly only due to get one if they pay for it, and the links to both the Channel tunnel and Heathrow long since dropped. By 2011, the then Transport Secretary Justine Greening had dropped the line that HS2 would be this massively environmentally advantageous project, and instead opted for saying it would be ‘broadly carbon neutral’. This was a massively misleading line from the Minister who also said that ancient woodlands threatened by HS2 could simply be moved, as that only considered the operation of the line, not the carbon impacts of actually building it. Since then reports from HS2 Ltd on carbon have got more and more convoluted and less and less clear. The most recent, published last month, is damning for any HS2 carbon credentials. At last HS2 Ltd decided to come clean and admit that even after 120 years, HS2 will produce a net increase in greenhouse gas emissions just in terms of operation, ignoring any carbon cost of building it. Even taking into account the carbon offset of 120 years of replacement woodland (174,000 tCO2e) soaking up CO2, HS2 still ends up being a net carbon contributor. After 120 years, the operation of HS2 is predicted to create 315,000 tonnes of CO2e, against only 307,000 tCO2e tonnes of benefits (although as many schoolkids taking part in the current Climate Strike protests are trying to point out, if we carry on like this, we might not have 120 years). Add in the massive 1,451,000 tCO2e tonnes of embedded carbon associated with the construction that is due to take place over the next 15 years, and you are presented with the very clear fact that going ahead with HS2 right now is completely irresponsible in environmental terms. And it’s actually worse than that, because it is clear that as always happens with HS2, these figures have been fiddled, and they’re not trying to hide it, it’s depressingly obvious. Although the figures for projected modal shift have changed since 2010, George Monbiot was quite right to point out that passengers transferring onto HS2 from existing electrified services would be transferring from less polluting alternatives. The reason for this is quite simple, more speed requires more power. And it’s not a linear relationship, power requirements exponentially increase with speed, which is why HS2 has such a high carbon footprint. 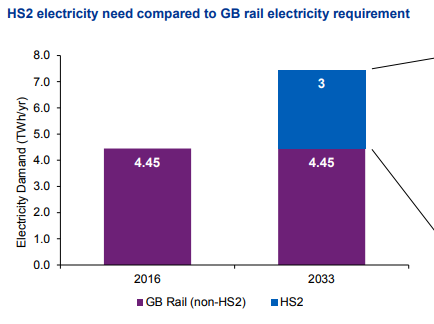 The most recent estimates were that HS2 would require about two thirds of the electricity the current rail network currently uses, or in other terms 1% of the entire output of the grid. Typical of the way that HS2 Ltd fiddle figures as a matter of course, this time to try and make their carbon impacts look good, they have decided to rewrite the laws of physics. HS2 Ltd somehow have decided that HS2 would emit 10 tCO2e per passenger kilometre, opposed to the 22 tCO2e per passenger kilometre that the slower intercity trains would emit. To even have the first chance of getting to such figures, you either have to assume that HS2 trains are over twice as energy efficient as trains going around half the speed, assume that all HS2 trains are full whilst the slower ones are all more or less empty, or add in some inter-city diesel trains that will be operating on existing lines halfway into the 22nd century. They also assume that inter urban cars will emit 67 tCO2e per passenger kilometre, despite the clear shift to electric vehicles which will of course have their power generated from the same mix as electric trains. How they have done all this is by picking a figure for carbon emissions that each mode of other transport will have in the year 2030, and deciding it will stay that way for over a century. According to HS2 Ltd, every other method of travel that people will be shifting from will be more polluting than HS2, and they’ve even added in the idea that more freight will run on other railways as a result of HS2, and they still can’t make it come out looking good. So the likelihood is, as it has always been, that HS2 will lead to a much larger increase in carbon emissions than is being admitted. The fundamental point is that if you want to decrease carbon emissions, you have to oppose HS2.